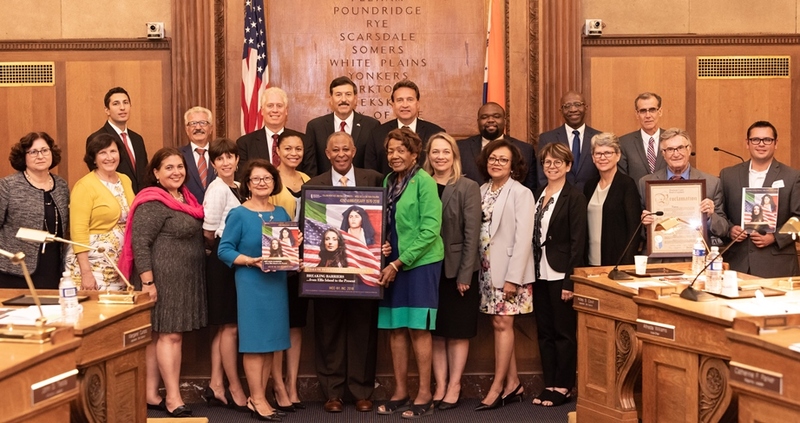 White Plains, NY — On Monday night, the Westchester County Board of Legislators marked Italian Heritage and Culture Month with a ceremony honoring community leaders and institutions, and outstanding Westchester students and teachers. After a rousing musical performance by Italian singer Alfio, Legislator Catherine Borgia (D - Briarcliff Manor, Cortlandt, Croton-on-Hudson, Ossining, Peekskill) presented a proclamation to the Westchester Coalition of Italian American Organizations, which was founded more than 25 years ago to preserve, promote and celebrate Italian and Italian American history, culture and ideals. Together with the Coalition, the Board honored 19 students and their teachers for their outstanding achievements in the study of Italian language and culture. Legislator David Tubiolo (R – Mount Vernon, Yonkers) presented a proclamation to Geraldine Esposito, President, Le Amiche Lodge #2550 of the Order of Sons and Daughters of Italy in America; Trustee, Italian Cultural Course of Westchester; Member, Yonkers Columbus Day Committee; Vice Chair, Yonkers Parks, Recreation & Conservation Board; and Board Member, Untermyer Performing Arts Council. Legislator Margaret Cunzio (C - Mount Pleasant, North Castle, Pleasantville), presented a proclamation to Matthew Manfredi, President & CEO, AAA Emergency Supply; Commissioner, North Castle South Fire District #1; Member, North Castle Housing Board; Assistant Chief of the North White Plains Fire Department from 1999-2001; and Chief of the North White Plains Fire Department from 2002-2008.